Vivera is a clear thermoplastic retainer designed to be used after completing orthodontic treatment. Because it can be made from a PVS impression, it can be used with both Invisalign system patients or any other orthodontic patients. Vivera® retainers are manufactured using the advanced fabrication technology behind Invisalign system aligners, resulting in a precise, smooth, and comfortable fit. Lab tests show that many leading clear thermoplastic materials from which retainers are made begin to deform in as little as two months of simulated wear*. This is why Align Technology introduced Vivera retainers as a series of four sets of retainers shipped over time to accommodate each patient’s unique retention needs. Each set can be worn for up to two (2) years. The fee for the Vivera Retainer System is $495. Aligner Bright antimicrobial gel is a very mild 8% carbamide peroxide gel designed for nightly use by those patients using clear aligners and clear retainers. The gel promises to maintain clean aligners and retainers, promote healthy gums and teeth, and gently whiten teeth. Patients like the immediate and long-term benefits of Aligner Bright gel: cleaner, better-smelling aligners, better gingival health, reduced caries potential—and also whiter teeth. Cleaner aligners and whiter teeth tend to increase patient compliance. Because Aligner Bright is 20% less concentrated than similar 10% gels, it is safe for extended periods. We instruct our patients to apply a very thin line of Aligner Bright on the buccal surface of each aligner, from molar to molar. They use Aligner Bright every night except Sunday, when they use a prescription fluoride rinse such as PreviDent. Each syringe of Aligner Bright should last about 15 days. Each kit contains two syringes with a fee of $25 per kit. It comes in a pump bottle as a unique cleaning gel that cleans the aligners really well when used with a toothbrush. It was created by an Invisalign patient, who struggled to keep his aligners clean, and who was always concerned about bacteria that could linger inside the aligners for almost two weeks. He worried about possible health consequences and set out to create a safe product for use on aligners. 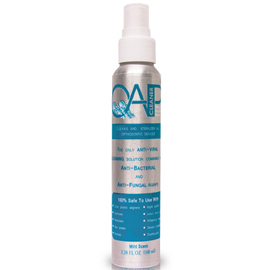 OAP has FDA approval, and, according to the manufacturer, OAP kills 99% of bacteria, viruses, germs, and microbes. Use of ordinary soaps and detergents is not encouraged since they may contain harmful substances that could be ingested. The manufacturer claims that if ingested accidentally, OAP is not dangerous, although, obviously, one should rinse the aligner fully before reinserting into one’s mouth. The product comes in a sleek bottle and is easily stored in the office or home bathroom. We tried it in our office, applied it to various dirty aligners that patients brought in, and were pleasantly surprised at how quickly it cleaned the aligners, when used with an ordinary toothbrush. The aligners really looked sparkling clear, and we strongly recommend. It is the only orthodontic device cleaner proven to kill viruses, bacteria, germs and fungus as well as being a true cleaner. The fee for each bottle is $35 and should last for several months. Additionally, an alternative way to clean Invisalign® aligners. Specially formulated Cleaning Crystals kill unwanted bacteria and remove plaque and stains, keeping your patient`s aligners odor-free, hygienic, and clear. Compact and easy to use. The kit includes an Aligner cleaning tub and a box of 50 packets of cleaning crystals. We instruct our patients to use weekly. Each kit is $75. Additional crystals can be ordered for $ 65 each (box of 50). Please contact The Practice at Maxwell Place using the form at the right side of the page or call 201-792-9400 today to schedule your Invisalign consultation. Dr. Frank DePaola serves patients in Hoboken, Jersey City, and throughout Hudson County, New Jersey.